Sadly to report they are no longer in business becasue of Carl F. Chutro's health problems. Many of these Haunted Ghost tours Tours go where no others have gone before. These Tours were Specifically Designed for Individuals of Discriminating Taste, who DARE Enter the Mysterious and Supernatural REALM OF SHADOWS. Traveling Accommodations while on the Tours will be aboard Spacious and Comfortable Tour Buses, or Mini-Buses, both with Courteous and Professional Drivers. East of Midnight with the Undertaker Spectral Shadow Tours is something new and definitely exciting in the Metro Chicago Area. obscure and out-of-the-way places in the area. Tours visits the most haunted and usual locations. Haunted Bachelor’s Grove Cemetery, and the lonely highway where walks the well known ghost of Resurrection Mary. Suburban Paid on call Firefighter and EMT, and is a Vietnam Combat Veteran. it might be like….than you will enjoy these tours. smaller parties, and Private Tours are welcome. He has been involved in all manner of death related situations, as a Police Officer, a Soldier, and an Undertaker. He has also, developed a keen interest and a background in many paranormal occurrences, locations and hauntings, and has conducted numerous investigations into such locations and events. Numerous incursions into Haunted areas as well as into potentially dangerous areas have grounded his experiences and knowledge in “hands-on” facts that others are not privy to. 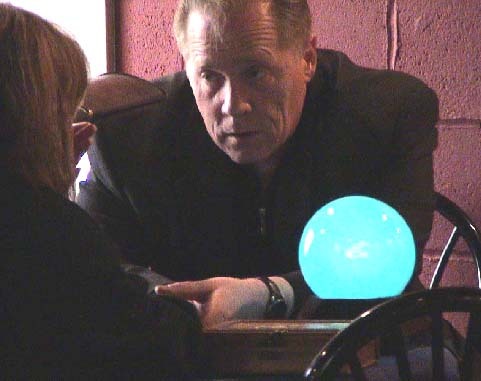 By the very nature of his careers, he has been personally involved in many situations and scenarios and “real time” occurrences that many of the “ghost hunters”, “paranormal investigators”, and “experts” in the field can only speculate on. His personal experiences and first hand knowledge are shared with tour participants in such a way that you are made to feel as if you have personally been there at the time and place of these occurrences, complete with the details and spine tingling feelings that would accompany such experiences. He introduces the participants to new locations not offered by other tours, and will go the extra distance to see that each experience is something unique and worth remembering. Your host has devoted much time and effort to provide the most intense and detailed experience possible. He does not believe in whirlwind tours, where 30 locations are visited in 3 hours, and nothing but fleeting glances at some of these locations are provided. He is also a firm believer in “one-on-one” dealings with tour participants, and is always open to suggestions on how to make these tours even better. Carl's tours were simply the best says Halley Clarkson, " I never missed visitng with him or taking his tour, they were the best and no other could ever compete or immitate his in anyway." 134 Cascade Drive, Indianhead Park, IL 60525-4427.